DinerMagic.com - Custom restaurant menus & websites. 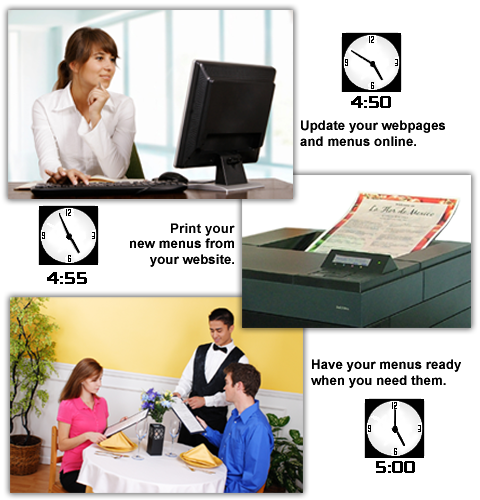 On-the-fly instant printable PDF menus to go. As a special offer to restaurrant owners and managers, we will create for your restaurant a working, demonstration website with your printable menus for you to test drive--just for sending us one of your menus! For more information and to request a Restaurant Information Pack, click here: SPECIAL OFFER! With DinerMagic we design for you a beautiful website and your menu in digitized format for a one-time charge of $495. Then you can update both your menu & website by yourself anytime, anywhere for just $29.95/month. DinerMagic is designed for both do-it-yourself Restaurateurs who want to save money and increase their sales, and for Affiliates, such as Foodservice Distributor Sales Reps who want to supplement their income and help keep their restaurant customers profitable and loyal to them.